Background To achieve a high level of patient satisfaction, providers need to identify and address patients' expectations. However, providers' beliefs and attitudes regarding expectations, as well as how to manage them, are not well understood. Methods The authors developed a survey to assess clinicians' awareness, attitudes, competence and performance with respect to patient expectations. The authors surveyed clinicians in four academic hospitals located in Denmark, Israel, the UK and the USA. Results The authors collected 1004 questionnaires (79.9% response rate) from four hospitals in four countries spanning three continents. Overall, 88.8% of respondents stated that clinician awareness regarding patient expectations was moderate to low, with significant differences between countries (p<0.001). Although 89.4% of clinicians believed it was important to ask patients about expectations, only 16.1% reported actually asking (p<0.0001). Nurses were more likely than physicians to ask patients about expectations (20.1% vs 11.5%, p<0.001). Only 19.6% of respondents felt they had adequate training to handle patients' expectations. In multivariate analyses, clinicians with greater awareness and adequate training were more likely to ask patients about their expectations. Conclusion While clinicians think it is important to ask patients about their expectations, they often fail to do so and consequently may not respond adequately. These results identify a ‘blind spot’ in clinicians' approach when attempting to address patient expectations and improve patient satisfaction, suggesting that healthcare organisations should take a more active role in increasing clinicians' awareness and initiating structured training programmes to cope with patient expectations. Despite interest in patient satisfaction and widespread use of patient satisfaction surveys to assess quality of care,2 relatively little research has focused on clinicians' attention to addressing patient expectations. Therefore, we undertook a study to examine clinician attitudes, performance and major determinants of their behaviour with respect to managing patient expectations, and did so in multiple countries to determine whether approaches differ across cultures. Between January and December 2009, we conducted a cross-sectional, multi-centre study surveying physicians and nurses from four academic hospitals located in Denmark (Aarhus University Hospital, Aarhus Sygehus), Israel (Assaf Harofeh Hospital, Zerifin), the UK (Oxford Radcliffe Hospital, Oxford) and the USA (Brigham and Women's Hospital, Boston). The survey instrument was developed based on a systematic literature review and in-depth interviews with physicians, nurses, researchers and senior administrators. Survey research experts further reviewed the draft survey to ensure comprehensibility and clarity. We conducted a pilot study with 20 physicians and 20 nurses after which the questionnaire was modified and shortened accordingly. To check the internal validity of the survey, we reversed several questions; the responses were symmetric, suggesting good internal validity. The final questionnaire included 32 questions (28 closed-ended questions and 4 open-ended questions) and consisted of three main sections related to patient expectations and satisfaction: clinicians' experience (eg, ‘Do you routinely ask your patients about their expectations for the hospitalization?’); perceptions towards hospital management activities (eg, ‘In your opinion, should hospital management take a more active role in conducting patient satisfaction improvement strategies and/or programs?’); and attitudes (eg, ‘In your opinion, is it important that clinicians talk with patients about expectations, which may have either been met or unmet?’). Furthermore, the survey included specific questions regarding awareness (eg, ‘In your opinion what are clinicians' levels of awareness towards patients' expectations regarding their hospitalization?’) and competence (eg, ‘In your opinion are clinicians trained to cope with patient expectations, which may have either been met or unmet?’). Apart from the four open-ended questions the majority could be answered on a 3-point scale, that is, ‘Yes’, ‘No’ and ‘Don't know’; however, for the two questions related to ‘Awareness’ we used a 4-point scale: ‘Low’, ‘Moderate’, ‘High’ and ‘Don't know’. For the purpose of providing robust data analysis, these were subsequently dichotomised into the following categories ‘Low/Moderate’ indicating modest awareness and ‘High’ indicating substantial awareness of patient expectations and patient satisfaction. The survey also asked about provider characteristics such as gender, years of hospital experience, seniority, administrative role and area of specialisation. The questionnaire was translated into Hebrew and Danish by a professional translator and retranslated into English to confirm accuracy. Our pilot study found that most (approximately 80%) clinicians responded ‘No’ to the question ‘Do you routinely ask your patients about their expectations regarding the hospitalization?’ Therefore, we estimated that 125 physicians and 125 nurses should be surveyed from each hospital to detect a statistical difference (80% power and 95% CI). Assuming a 20% non-response rate, a representative statistical sample of 157 physicians and 157 nurses was chosen from the medicine and surgery departments at each hospital. All physicians (resident and attending) and nurses (registered nurse with and without an academic degree) from the medicine and surgery departments were eligible for participation; clinicians from other clinical settings were excluded. A de-indentified, systematic random sample of clinicians was generated using random number blocks. Thus, the first clinician was chosen at random, and subsequently, every fifth clinician was selected. Of 1256 eligible clinicians approached, 1004 completed the survey, yielding a response rate of 79.9%. The research team administered the survey in person and/or sent the questionnaire to the chosen clinicians through intrahospital mail. Clinicians received an envelope including a cover letter, the survey and a return envelope. Non-respondents received reminders by intrahospital mail. Participating physicians and nurses were assured confidentiality and anonymity of their responses and were asked to return the questionnaire in the attached envelope. The study protocol and survey instrument were approved by the Institutional Review Board of each hospital. Surveys from all study sites were returned to the Brigham and Women's Hospital for data entry. Data was coded by country and entered into a computer database by research staff. SAS (V.9.2) was used for data analysis, including χ2 tests and analysis-of-variance testing for univariate analyses. Multivariable analyses were conducted using logistic regression. All statistical tests were conducted at the 95% CI level using Pearson's χ2 test for independence on contingency tables. Of 1004 responders (table 1), 54.6% worked in departments of medicine. Almost half (46.6%) were physicians, of which 61.5% were attendings. Slightly more than half of the nurses held an academic degree. Administrative roles were held by a minority (18.3%), and women comprised 70.8% of the responders. Approximately 7% of responders had less than 1 year of hospital experience, and the rest were divided equally across each of the other subcategories. Overall, clinicians were evenly distributed among the four countries. Regarding the main research question, ‘Do you routinely ask your patients about their expectations regarding hospitalization?’, only 16.1% of clinicians stated that they routinely ask their patients (table 2). 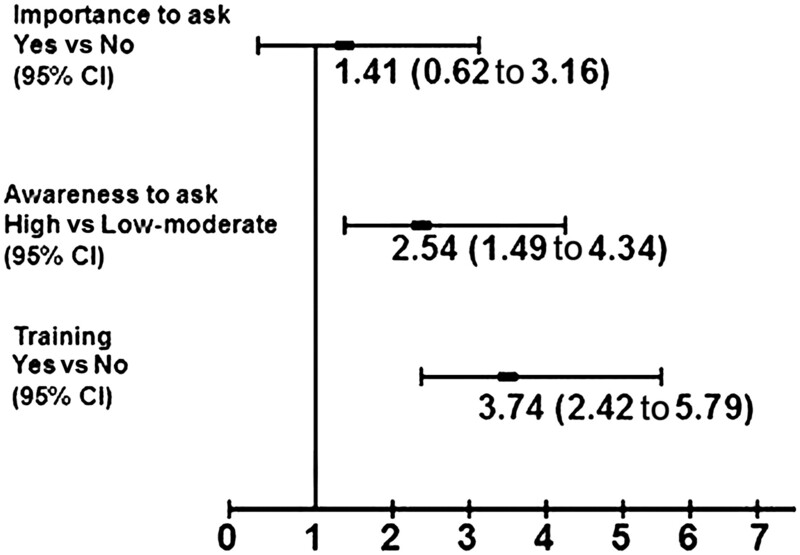 Nurses were more likely to ask than physicians (20.1% vs 11.5%, respectively, p<0.001). In multivariable analyses, nurses were more than twice as likely to ask than physicians (OR 2.58; 95% CI 1.60 to 4.15), and clinicians with more than 10 years of hospital experience were almost three times more likely to ask compared with clinicians with 1–4 years of hospital experience (OR 2.89; 95% CI 1.51 to 5.51). Results also varied between the countries (figure 1). 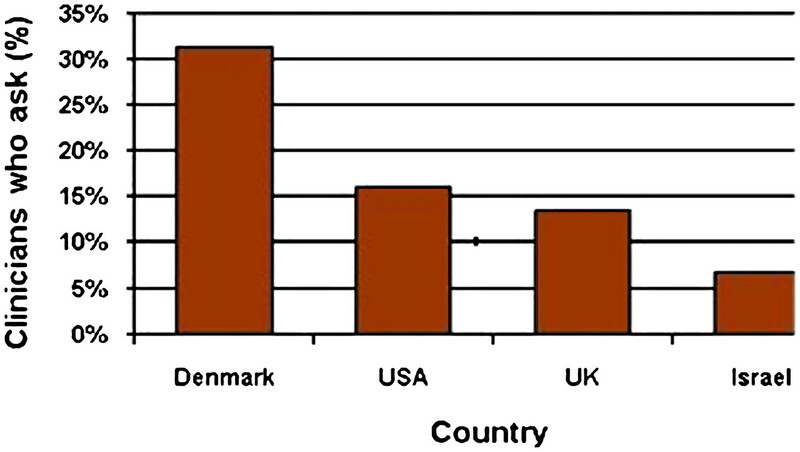 Compared with Israeli clinicians, Danish clinicians were three times more likely to ask (OR 3.04; 95% CI 1.57 to 5.88), while clinicians from the USA and the UK were about twice as likely to ask patients about their expectations (USA: OR 2.07; 95% CI 1.08 to 3.95; UK: OR 2.15 95% CI 1.13 to 4.08). Percentage of clinicians who reported routinely asking patients about their expectations distributed at countries. The figure illustrates the average proportion of clinicians in each of the participating countries who responded ‘Yes’ to the question ‘Do you routinely ask your patients about their expectations for the hospitalization?’ (p value <0.001). Overall, 88.8% of clinicians stated that clinician awareness of patient expectations was moderate to low with significant differences between countries (p<0.001). The level of awareness did not differ significantly between physicians and nurses (p=0.83). We found a statistically significant difference between respondents' years of experience and high levels of awareness (<1 year 8.8%, 1–4 years 8.2%, 5–7 years 4.8%, 8–10 years 10.5% and >10 years 25.5%). In multivariate analyses, clinicians with more than 10 years of hospital experience were twice as likely to have higher awareness than clinicians with 1–4 years of experience (OR 2.08; 95% CI 1.03 to 4.18). Overall, 89.4% of clinicians believed it was important to ask patients about their expectations. Compared with physicians, nurses found it more important to ask patients about their expectations (85.2% and 91.4%, respectively; p<0.001). In addition, nurses believed that it is more important to respond to patients' expectations than physicians (90.1% and 86.1%, respectively; p=0.04). The majority of clinicians (88.5%) stated that it is important to respond to patients' expectations in a structured way. Of the respondents, 67% indicated that clinicians should document patient expectations in the record (physicians 55.3% and 78.1% nurses; p<0.001). Less than one-fifth of clinicians felt they had adequate training to handle patients' expectations, with significant differences between countries (Denmark 42.6%, Israel 9.3%, the UK 14.2% and USA 16.7%; p<0.001). For example, clinicians in the USA were more than twice as likely to be trained as clinicians in Israel (OR 2.49; 95% CI 1.40 to 4.46). Multivariate analyses indicated that nurses were more likely to be adequately trained than physicians (OR 1.79; 95% CI 1.18 to 2.71) and clinicians with administrative roles (OR 2.85; 95% CI 1.77 to 4.58). We found no association between clinicians' beliefs that it is important to ask patients about expectations and their performance (OR 1.41; 95% CI 0.62 to 3.16). The major determinants of managing patient expectations were clinicians' level of awareness and adequate training (figure 2). Predictors for asking patients about their expectations. Adjusted OR for clinicians' attitudes regarding the importance of asking patients about their expectations (Yes vs No); level of awareness of clinicians with respect to patient expectations (High vs Low/Moderate); and clinicians who reported that they had adequate training to cope with patient's expectations (Yes vs No). The models were adjusted for: countries, clinicians, area of specialisation, years of hospital experience, administrative role and gender. Multivariate analyses revealed that clinicians with greater awareness were more than twice as likely to ask as clinicians with lower awareness (OR 2.54; 95% CI 1.49 to 4.34). Clinicians with adequate training were almost four times more likely to ask than clinicians without training (OR 3.74; 95% CI 2.42 to 5.79). Other factors associated with clinicians routinely asking patients about their expectations were clinician type, years of hospital experience and country of practice. Overall, 83.6% of physicians and nurses stated that achieving high levels of patient satisfaction was important for the clinical success of healthcare organisations. There was a statistically significant difference between physicians (72.8%) and nurses (84.7%; p<0.001), and between countries (p=0.03). Of responders, 6.9% stated that their department had a structured plan for managing patient expectations, with significant differences between physicians and nurses (3.8% and 9.5%, respectively; p<0.001). A similar difference was observed between the countries (p<0.001). Finally, 85.5% of clinicians thought that hospital management should take a more active role in conducting patient satisfaction improvement programmes. In this international study, we evaluated the major determinants of clinician performance with respect to managing patient expectations. We found that almost nine in ten clinicians felt their awareness of patient expectations was inadequate. We also discovered that while nearly all clinicians stated that it was important to ask patients about their expectations, only 16% reported actually asking. This finding reflects an unrecognised gap between the importance clinicians place on addressing patient expectations and their performance. This discrepancy appears to represent a ‘blind spot’ in clinicians' approach to patient expectations and patient satisfaction (figure 3). Despite emphasis on patient-centred care by many groups, including the Institute of Medicine,1 our data raise concerns regarding the responsiveness of clinicians towards the needs and expressed preferences of individual patients. Even though clinicians think it is important to obtain information about patient expectations and respond adequately, they often fail to perform this step. The ‘blind spot’ of patient satisfaction. 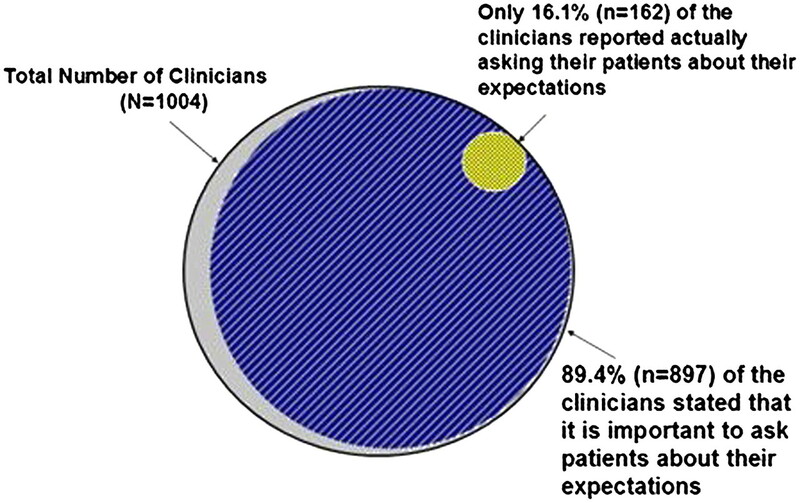 The figure illustrates the proportion of clinicians actually asking the patients about their expectations (yellow) compared with clinicians who think it is important to ask (blue). The full circle (grey) represents the overall number of respondents in the survey. Previous studies have emphasised that clinicians frequently neglect to solicit information about patients' expectations,9 15 16 tending to underestimate and not recognise them,18 19 resulting in unmet expectations.16–18 Moreover, unfulfilled patient expectations were associated with poorer satisfaction,7 8 17 low clinical guideline adherence20 and poor overall health outcomes.3 21 Consequently, a growing body of evidence supports the importance of identifying and addressing patients' expectations.7 9–15 22 Jackson and colleagues23 found that when physicians were informed of patients' previsit expectations, they were better able to meet them; unmet expectations were reduced by 50%. Our study confirms and extends findings that have shown poor performance of clinicians with respect to managing patient expectations, not only by highlighting the problem but also by identifying the main determinants of the clinician's ‘blind spot.’ After adjusting for other characteristics, we found no association between clinicians who stated that it was important to ask patients about their expectations and their performance. Thus, clinician preferences appear to be insufficient to affect their performance. We discovered that the level of awareness and adequate training were the major determinants of clinicians' approach to addressing patient expectations. These findings reveal that clinicians with greater awareness were more likely to ask patients about their expectations. Similarly, clinicians with adequate training were more likely to ask patients. The fact that we found that clinicians' awareness regarding patient expectations was moderate to low, and less than a fifth of clinicians felt they had adequate training to cope with patients' expectations, may explain why clinicians around the world often fail to address patients' expectations. Consistent with this notion, previous studies have shown that clinicians who were aware of patients' expectations were better able to satisfy patients' wishes,24 and physicians who had received training to elicit patient expectations were more likely to address these expectations.9 25 26 Consequently, although the reasons for clinicians' failure to address patient expectations are not always clear, our findings imply that clinicians should become more aware of the need to both address patient expectations and develop communication skills to successfully handle those expectations. These findings have implications on healthcare organisations' approach towards patient satisfaction in general and patient expectations in particular. First, our findings emphasise that patient satisfaction should be an integral part of the quality of care in modern healthcare organisations. Second, the findings imply that healthcare organisations should develop and implement structured intervention models for patient satisfaction as a dynamic entity that incorporates clinicians' efforts to address patients' expectations of care. We believe that these models should incorporate assessment of patients' expectations explicitly at the time of hospitalisation and address them throughout the hospital stay. In addition, the models should involve training of nurses and physicians to ascertain, address and document patients' expectations during hospitalisation. However, we think it would be premature to make definitive recommendations regarding what should be considered adequate training in this area. We believe that in the short run, it should be part of the hospital's quality improvement initiative and in the long run, training could be an integral part of the graduate medical/nursing education programmes and/or continuing medical education. Finally, we suggest that future studies should investigate different elements designed to empower patients to express their expectations and engage clinicians in a dialogue about those expectations. Our study also highlights substantial differences between clinician groups. Although nurses and physicians share important roles and responsibilities for delivering patient-centred care,27 we found that nurses were more likely to ask patients about expectations than physicians and appeared to have greater awareness and better skills to manage these expectations. Bluemel and colleagues28 found that nurses showed greater interest in identifying patients' expectations, as they were professionally trained to address patients' needs and concerns as opposed to physicians who, in general, are trained to focus on diagnosis, treatment and vital impairment. Nonetheless, in our study the majority of both nurses and physicians did not address patients' expectations. This study has a number of limitations. Due to the cross-sectional design, we have shown association but cannot confirm any causal relationships. Further investigation of how these findings change over time and factors that underlie their improvement would be helpful. Our survey was limited to clinicians in a few academic hospitals, and we included clinicians only from departments of medicine and surgery, which limits the generalisability of our results. Like all surveys, our study may have been subject to potential response bias. Although we had a high response rate, it is possible that clinicians who responded had a greater interest in patient expectations than non-responders. It appears that clinicians lack both awareness and adequate training to address patients' expectations routinely. These data suggest that healthcare organisations should take a more active role in increasing clinicians' awareness. Conducting training to cope with patient expectations and initiating structured programmes for managing patient expectations might in turn improve outcomes. We would like to thank all the clinicians who took part in the study and the hospital management in each of the four study sites for all their support and co-operation. We also want to thank Erin E Hartman for superb assistance with editing the final version of the manuscript.
. Patients' perceptions of hospital care in the United States. N Engl J Med 2008;359:1921–31.
. The relationship between patients' perception of care and measures of hospital quality and safety. Health Serv Res 2010;45:1024–40.
. Satisfaction: A Behavioral Perspective on the Consumer. 2nd edn. New York: M.E Sharpe, 2010.
. The effect of patients' met expectations on consultation outcomes. A study with family medicine residents. J Gen Intern Med 2007;22:86–91.
. Meeting patient expectations of care: the major determinant of satisfaction with out-of-hours primary medical care? Fam Pract 2002;19:333–8.
. Patient expectations: what do primary care patients want from the GP and how far does meeting expectations affect patient satisfaction? Fam Pract 1995;12:193–201.
. Soliciting the patient's agenda: have we improved? JAMA 1999;281:283–7.
. The effect of physician solicitation approaches on ability to identify patient concerns. J Gen Intern Med 2005;20:267–70.
. Addressing patient beliefs and expectations in the consultation. Best Pract Res Clin Rheumatol 2010;24:219–25.
. Unmet expectations for care and the patient-physician relationship. J Gen Intern Med 2002;17:817–24.
. Clarifying the expectations of patients undergoing implant breast reconstruction: a qualitative study. Plast Reconstr Surg 2010;126:1825–30.
. The effect of physician behavior on the collection of data. Ann Intern Med 1984;101:692–6.
. Do physicians take into account patients' expectations? J Gen Intern Med 1994;9:404–6.
. Prevalence and sources of patients' unmet expectations for care. Ann Intern Med 1996;125:730–7.
. Internal medicine patients' expectations for care during office visits. J Gen Intern Med 1994;9:75–81.
. Patients' desires and expectations for medical care in primary care clinics. J Gen Intern Med 1998;13:273–6.
. “Adherence” and the negotiated approach to patienthood. Arch Gen Psychiatry 1979;36:393–8.
. Patients' unvoiced agendas in general practice consultations: qualitative study. BMJ 2000;320:1246–50.
. The effect of unmet expectations among adults presenting with physical symptoms. Ann Intern Med 2001;134:889–97.
. Effects of physician awareness of symptom-related expectations and mental disorders. A controlled trial. Arch Fam Med 1999;8:135–42.
. Patients' expectations for medical care: an expanded formulation based on review of the literature. Med Care Res Rev 1996;53:3–27.
. The effects of two continuing medical education programs on communication skills of practicing primary care physicians. J Gen Intern Med 1993;8:318–24.
. Effect of communications training on medical student performance. JAMA 2003;290:1157–65. Institute of Medicine. The Future of Nursing: Leading Change, Advancing Health. The National Academies Press, Washington, DC, 2010.
. Expectations of patients, nurses and physicians in geriatric nursing home emergencies. Emerg Med J 2011;28:283–6. Unit of Patient-Perceived Quality, The Capital Region of Denmark—Surveys and Research Concerning Patient Experiences, 2011. http://www.patientoplevelser.dk/index.asp?id=210 (accessed 12 Apr 2011).
. Patient surveys—A key to organizational change? Patient Educ Couns 2010;78:394–401. Funding This study was partially supported by the NHS South Central (UK). The funding was used for the travel expenses of RR to the UK (Oxford Radcliffe Hospital, Oxford) research site and to support the data analysis. NHS South Central was not involved in the study design, data collection, data analysis, data interpretation, writing of the manuscript or in the decision to submit the publication. Ethics approval The study protocol and survey instrument were approved by the Institutional Review Board of each one of the four participating hospitals: Denmark (Aarhus University Hospital, Aarhus Sygehus); Israel (Assaf Harofeh Hospital, Zerifin); UK (Oxford Radcliffe Hospital, Oxford); and USA (Brigham and Women's Hospital, Boston). Data sharing statement Survey data are available from the corresponding author on request.